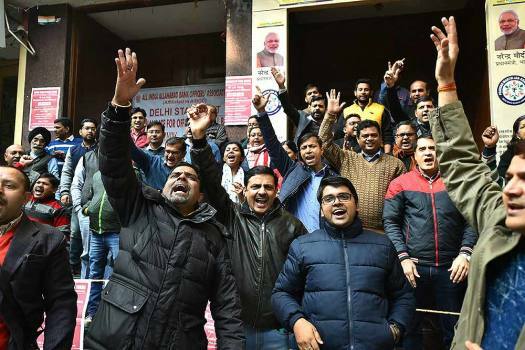 Bank employees stage a protest against the proposed merger of Vijaya Bank and Dena Bank with Bank of Baroda, during a nation-wide strike, in New Delhi. The merger marks the first-ever three-way amalgamation in the country's banking sector. The government will merge state-owned Vijaya Bank, Dena Bank and Bank of Baroda to create India's third largest lender.